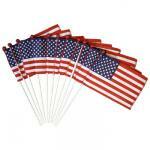 Saf-T-Ball U.S. Mini Flags On Staff 4" x 6"
100% made in America. Our 4" x 6" Saf-T-Ball Flags are made of a Poly-Cotton Blend and are hemed all around the flag for a beautiful finish. They feature a red ball on top that makes them safer than Spear Top flags. Staffs are white. 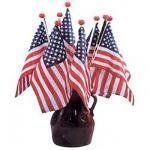 Saf-T-Ball U.S. Mini Flags On Staff 8" x 12"
100% made in America. Our 8" x 12" saf-T-Ball flags are made of a poly-cotton Blend, fully hemed and they feature a red ball on top that makes them safer than Spear Top flags. Staffs are white.